Sure you've tried carrot cake before, but have you ever made one with pineapple? 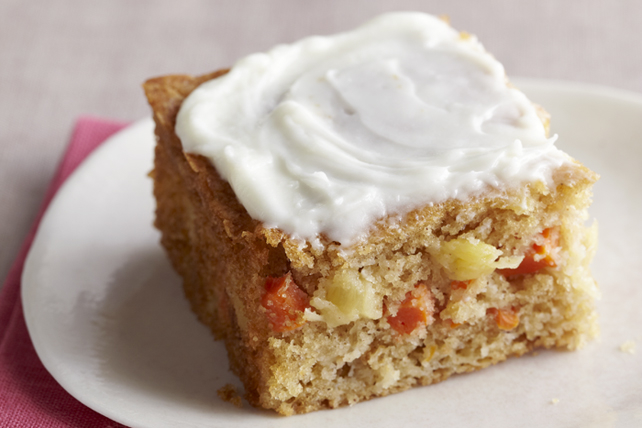 A can of crushed pineapple is the secret ingredient in this cream cheese-frosted carrot cake. Stir flour, baking powder, baking soda and spices in medium bowl with whisk until well blended. Whisk next 5 ingredients in large bowl until well blended. Stir in carrots and pineapple. Add flour mixture; mix well. Pour into 8-inch square pan sprayed with cooking spray. Bake 30 to 35 min. or until toothpick inserted in centre comes out clean. Cool completely. Mix remaining ingredients until well blended. Spread onto cake. For a stronger spice flavour, increase cinnamon and nutmeg to 1 tsp each. Since this delicious cake is made with better-for-you products, it makes a delicious addition to your healthful eating plan.